An international exchange of compelling performances. 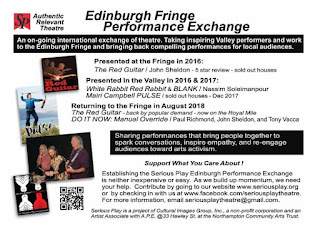 Taking work of inspiring Valley performers to the Fringe festival every August, and bringing back bold and authentic work for local audiences. 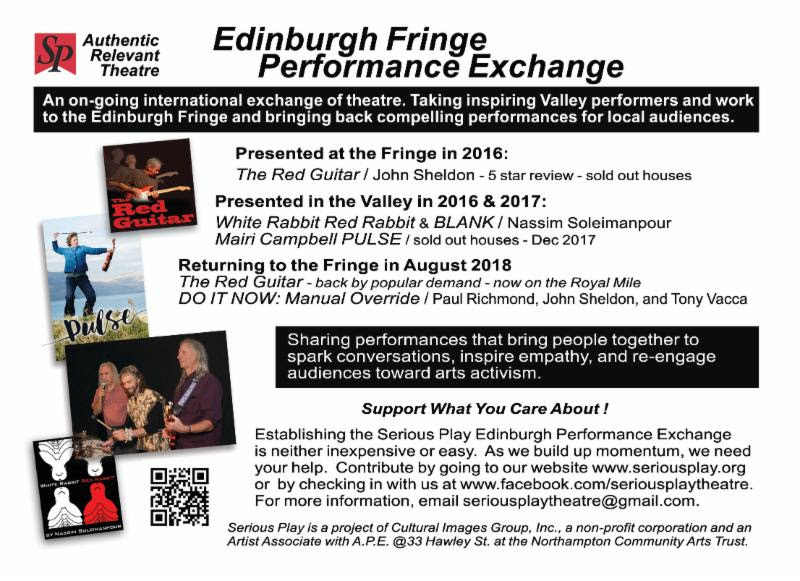 That's our focus going forward; work with Western Mass artists to bring high quality performances to Scotland and select dynamic new work there to bring back to the Valley. It started by taking The Red Guitar to Scotland in 2016 and we returned with Mairi Campbell's PULSE and Nassim Soleimanpour's White Rabbit Red Rabbit. We are headed back this year and will need regional support to keep up the momentum. Your help is most appreciated. Serious Play is taking John Sheldon's The Red Guitar back to the Edinburgh Fringe Festival for the month of August. After a 5-Star review in 2016 from The Herald, a return was only a matter of time. 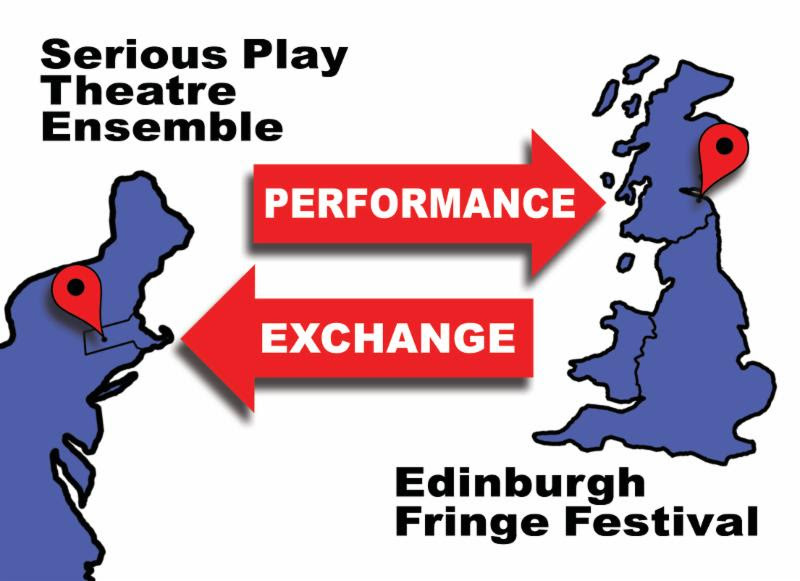 Eager to bring even more talent from Western Mass to the world stage in Scotland, Serious Play will also produce DO IT NOW at the Fringe Festival this August. Tony Vacca (percussion) and Paul Richmond (spoken word) will join John Sheldon in a new piece called Manual Override. loop sculpture plucking chords of your memory. continues, setting a course to the center of who we truly are: vibration. I have collaborated with John on many Serious Play productions over the past 10 years. He does not use music, he is music. It is this rare sense of connection and assurance that drives his creative gift. text. An evening of food for the mind as well as the soul. power of words and humor to tackle the unthinkable and seemingly unsolvable, giving birth to creativity and hope. Paul has performed on stages from the Austin International Poetry Festival, in Austin TX, to Gödör Klubban at the Jazzköltexzetiest in Budapest, Hungary. He is widely published in books, journals, anthologies, and poetry collections. His Human Error Publishing promotes Word events and festivals and publishes books. Diop, Senegalese master of the tama or talking drum. Massachusetts USA, where it was founded over 25 years ago. The company works to create a dynamic integration of theatre, movement and text, and has a history of engagement with ensemble-created scripts that are informed by contemporary issues. Productions have toured to NYC and Boston, and to Athens, London, Edinburgh and to the JoakimInterFest in Kragujevac, Serbia, where its production of the politically charged Milosevic at the Hague, won an international award for “dramatic innovation and theatrical boldness”. 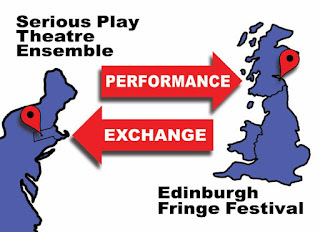 Serious Play is a member of NET, the Network of Ensemble Theaters, and an Artist Associate with A.P.E. @ 33 Hawley St., a partner with the Northampton Community Arts Trust.